I've been thinking about this for awhile now and I thought I would share it with everyone. We always hear people say things like "My Dream is to have this or that." Or they say "If I work really hard for the next 3 to 5 years, then I can achieve my dreams and my whole life will be different." So why instead of always making these long term goals and multi-year dreams that we may or may not achieve depending on who you are and how committed you are to achieving your dream we did a "Dream Day"? Dream Day is where for one day you make one of your dreams come true and try to share that dream with as many people as possible. An idea might be that you have a dream to go to deep sea fishing for marlin. Why not put a plan in place to make that happen for just one day? And why not take as many people as you can with you to let them live out that dream as well? Give it some thought and let me know what ideas you come up with. 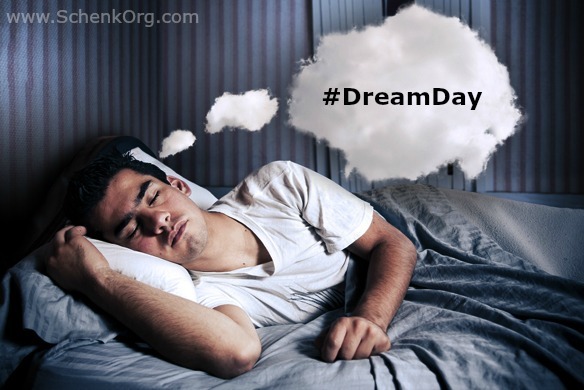 If you decide to do this idea use this hashtag on social media ( #DreamDay ) so that the rest of us can follow along with you on your special day.